Visit us at the Belle Bridal Show at Hyatt Place Dewey Beach and learn all about the new Ultimate Bachelorette Package. This all inclusive package includes 3 activities over a 2 or 3 daytime. 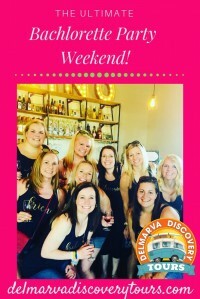 - Choose from a 4 hour Craft Beverage Tour or Wine and Garden Tour with Delmarva Discovery Tours, includes all tasting fees, local door to door transportation, snacks, water and photography. -Choose from a private Guided Kayaking, Paddleboarding or Paddleboard Yoga excursion which includes a lesson, a guide, all gear and photography. This is provided by Delmarva Board Sports, our sister company, located in Dewey Beach and is within walking distance if you are staying in Dewey Beach. Paddleboard Yoga is provided by Dewey Beach Yoga and is customized for bachelorette groups with lots of special touches such as a complimentary momento for each member of the bride tribe and a special gift for the bride to be. - A 2 hour customized creative workshop such as a customized wedding theme or home decor sign painting or a calligraphy workshop.